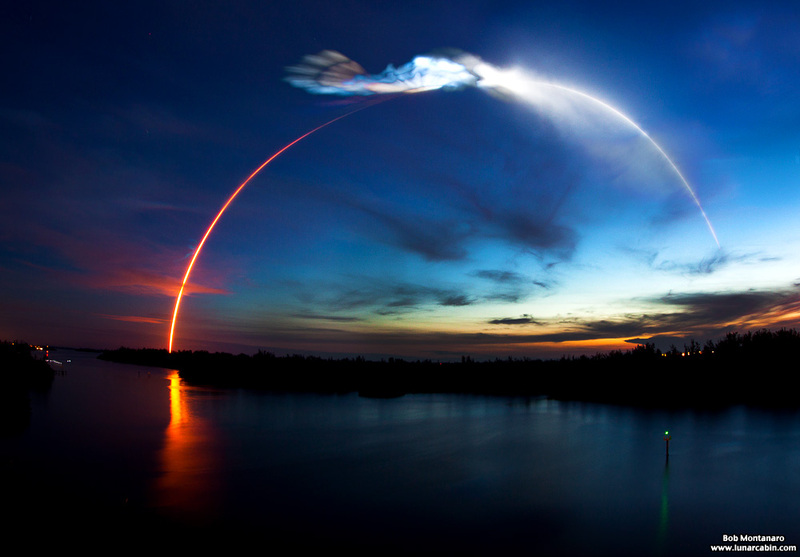 A time exposure shows the last SpaceX Falcon 9 Block 4 rocket arcing up into the sky before vanishing below the horizon after lifting off at 5:42 a.m. on 29 June 2018 from Space Launch Complex 40 at Cape Canaveral Air Force Station on the fifteenth Commercial Resupply Services (CRS-15) mission to the International Space Station (ISS) on behalf of NASA. Both Falcon 9 and the Dragon spacecraft for the CRS-15 mission are flight-proven. Falcon 9’s first stage previously supported the TESS mission in April 2018, and Dragon previously supported the CRS-9 mission in July 2016. SpaceX did not attempt to recover Falcon 9’s first stage after launch. The Dragon spacecraft is filled with more than 5,900 pounds of supplies and payloads, including critical materials to directly support more than 250 science and research investigations that will occur onboard the orbiting laboratory. Dragon will return to Earth with more than 4,000 pounds of cargo after an approximately one-month stay at the International Space Station. Dragon will reenter the Earth’s atmosphere and splash down in the Pacific Ocean off the coast of Baja California.